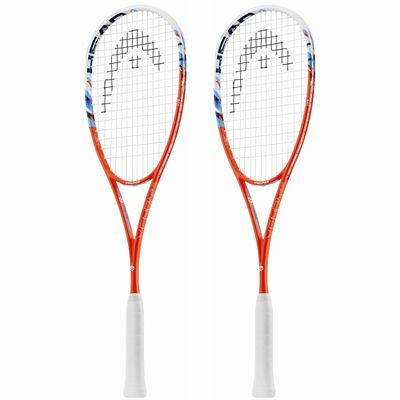 Providing players with impressive spot-on precision, the Head Graphene XT Xenon 120 Slimbody Squash Racket double pack includes two quality frames designed specifically for highly balanced performance. It blends excellent manoeuvrability and control thanks to the mid-plus sized head, and utilises the Graphene XT technology to boost potential power and frame speed. Each racquet is strung with Evolution Pro string providing exceptional playability and touch, plus due to the AFP (Adaptive Fan Pattern) technology – two stringing patterns are at hand, thus giving options for different styles of playing. Furthermore, for superior protection against dust and scratching, both racquets arrive respectively with a full-length cover. for submitting product review about Head Graphene XT Xenon 120 Slimbody Squash Racket Double Pack.